"I wish I had done everything on earth with you." The short answer is that this film is nowhere near the travesty that the trailers have led me to believe it was going to be. Don't get me wrong, it's got issues, they are numerous, and I will dive into them, but overall, I was impressed by how much relative restraint Luhrmann was working with, especially considering that's never been known to be a quality he had in any measurable quantity. 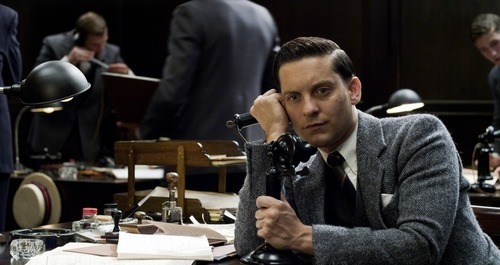 For those of you that managed to escape high school without having to read the novel, The Great Gatsby tells the story of Nick Carraway (Tobey Maguire, who possesses Matthew Broderick's inability to age past 23) is an idealistic stock broker living in the fictional town of West Egg, NY during the Jazz Age. 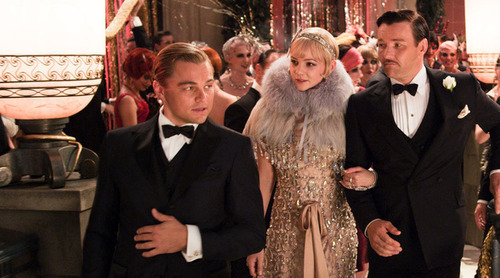 Carraway's cousin is Daisy Buchanan (Carey Mulligan) who lives with her husband Tom (Joel Edgerton) in old money East Egg, just across the harbor, but it's his neighbor, the reclusive & enigmatic Jay Gatsby (Leonardo DiCaprio), that helps Nick to come out of his shell. 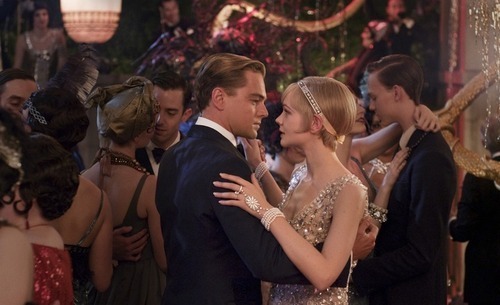 Gatsby throws elaborate parties every weekend at his mansion, and Nick attends one on invitation from Gatsby himself. 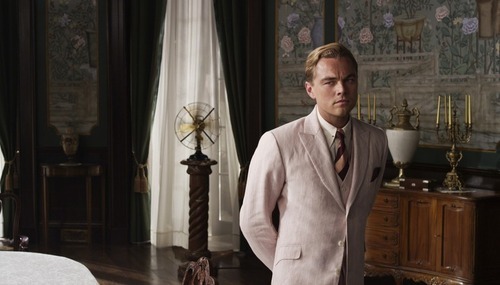 He is instantly sucked into a brave new world, and comes to find out that Gatsby is desperate to reconnect with Daisy, the proverbial "one that got away." Nick is conflicted because his cousin is a married woman, but he is persuaded by Gatsby's numerous charms, and also his extraordinary sense of hope. The further we dig into the world, the more we see that no one is really who they appear to be on the surface, and the love triangle of Daisy, Tom & Gatsby is doomed to meet with a fatal end. The first thing that I was taken with was how similar the structure of the first act of Luhrmann's Moulin Rouge is to Gatsby. I would have to watch them both again to prove this theory, but the major beats seemed to be identical, all the way up through Gatsby's introduction (set brilliantly to Gershwin's "Rhapsody in Blue"). The frantic pace established in the first thirty minutes of the film slows at this point, though, and I was downright shocked at how Luhrmann managed to fight his baser instincts and just let the story play out in a very classical way. The rapid fire editing, camera tricks & gratingly anachronistic soundtrack choices begin to take a back seat to the love story portion Fitzgerald's story. The major problem with this, however, is that Luhrmann can't maintain this sort of pace either, and the climactic scene set at The Plaza Hotel, just lies on the screen like a cold, dead fish. The scene is so devoid of anything even resembling a spark, I found myself beginning to check my watch with regularity from this point on. What's more, the fatal car crash that follows this scene is so laughably melodramatic, that whatever semblance of momentum that had been building to this point dies right along with the somewhat minor character killed in the crash. I will fully admit to actually being on board with almost every choice that Luhrmann made up until this point (except for his grating soundtrack choices). I would even go so far as to say that the film was excellent up until the Plaza Hotel scene. The tone, pacing & major story beats all worked together seamlessly to make the film highly watchable. Luhrmann's use of 3D was similarly good, utilizing depth of field well, and even tacking a brilliant, lingering lens flare on to the green light at the end of the Buchanan's dock. But the film's final thirty minutes are patently awful, borrowing liberally from Billy Wilder's Sunset Boulevard. The last thing I want to mention delves a bit into spoiler territory, so if you want to go in fresh, skip to the next paragraph. My number one issue with the film was its fundamentally flawed understanding of the character of Daisy. Perhaps it's just based around my view of the world at the time I first read the novel, but I always saw Daisy as the primary antagonist of the novel, much more actively involved in bringing about Gatsby's demise. Here she seemed to be written to be a worthless pawn of the powerful men around her. I can't possibly be alone in thinking this about her, but it certainly never crossed the minds of Luhrmann or his co-writer Craig Pearce. The performances are probably the weakest thing about the entire film. DiCaprio stands head and shoulders above the rest of the ensemble, giving us, arguably, the definitive portrayal of Gatsby on screen. He shows all of the vulnerability and naivete that most other men to portray the role have kept hidden, and this makes him as endearing to the audience as he is to Nick. The other main players are all decidedly weaker. I've never been a fan of Tobey Maguire as an actor, but he's the cinematic equivalent of a wet sandwich in this film. He has no personality, and if he didn't constantly remind you of how smitten with Gatsby he was, you'd never know it from the blank expression he wears throughout the entire film. Carey Mulligan is perfectly fine as Daisy, I think I just hated the filmmakers' interpretation of the character too much to decide whether or not she was actually good in the film. Joel Edgerton is an actor I've come to like quite a bit, particularly since his role in Animal Kingdom, but here he's woefully miscast. The scene I keep harping on, set at The Plaza Hotel, he played all wrong, and he never seems to be truly manipulative in the way an old money Buchanan would. He just sort of plays him like a dope. The rest of the supporting cast is fine, and Bollywood fans should get a kick out of seeing Amitabh Bachchan as Gatsby's dubious business associate Meyer Wolfsheim. I was a senior in high school when Baz Luhrmann brought teenagers out in droves to see his interpretation of Romeo + Juliet, and if the late night screening I attended of Gatsby last night is any indication, he's about to work similar magic with young people once again. I only hope this prompts them to actually read the novel though, as the film is very firmly an interpretation of the novel and not the final word on it (hopefully). I liked the film a lot more than I ever thought I would, but the film's third act is fatally boring, unoriginal and downright stupid at times. This is not the disaster I thought it was going to be, but it's also not the great film the first hour or so led me to think it might turn out to be.